PISAC, Peru , Dec 29 2014 (IPS) - In this town in Peru’s highlands over 3,000 metres above sea level, in the mountains surrounding the Sacred Valley of the Incas, the Quechua Indians who have lived here since time immemorial are worried about threats to their potato crops from alterations in rainfall patterns and temperatures. 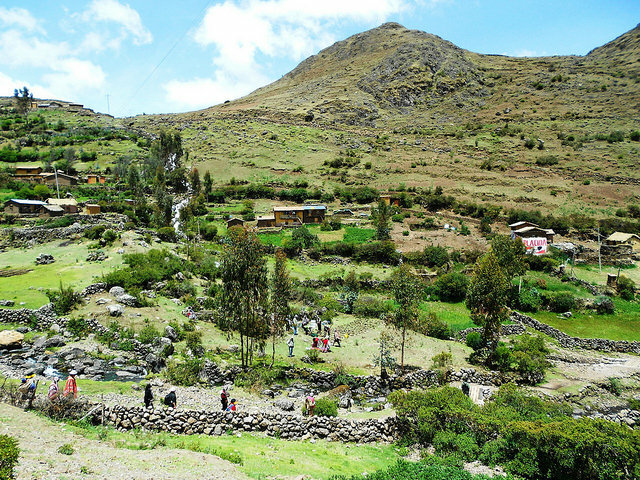 If the drought stretches on, as expected, “we won’t have a good harvest next year,” said Loayza, who is head of the Parque de la Papa or Potato Park, a biocultural conservation unit created to safeguard native crops in the rural municipality of Pisac in the southeastern department or region of Cuzco. In the Parque de la Papa, which is at an altitude of up to 4,500 metres and covers 9,200 hectares, 6,000 indigenous villagers from five communities – Amaru, Chawaytire, Pampallaqta, Paru Paru and Sacaca – are preserving potatoes and biodiversity, along with their spiritual rites and traditional farming techniques. The Parque de la Papa, a mosaic of fields that hold the greatest diversity of potatoes in the world, 1,460 varieties, was created in 2002 with the support of the Asociación Andes. This protected area in the Sacred Valley of the Incas is surrounded by lofty peaks known as ‘Apus’ or divine guardians of life, which until recently were snow-capped year-round. “People are finally waking up to the problem of climate change. They’re starting to think about the future of life, the future of the family. What will the weather be like? Will we have food?” 50-year-old community leader Lino Mamani, one of the ‘papa arariwa’ – potato guardians, in Quechua – told IPS. He said that whoever is sceptical about climate change can come to the Peruvian Andes to see that it’s real. “Pachamama [mother earth, in Quechua] is nervous about what we are doing to her. All of the crops are moving up the mountains, to higher and higher ground, and they will do so until it’s too high to grow,” he said. As temperatures rise, plant pests and diseases are increasing, such as the Andean potato weevil or potato late blight (Phytophthora infestans). To prevent crop damage, over the last 30 years farmers have increased the altitude at which they plant potatoes by more than 1,000 metres, said Mamani. That information was confirmed by the Asociación Andes and by researchers at the International Potato Centre (CIP), based in Lima. But the most dramatic effects for Cuzco’s Quechua peasant farmers have been seen in the last 15 years. “Nature used to let us know when was the best time for each step, in farming. But now, Pachamama is confused, and we are losing our reference points among the animals and the plants, which don’t have a flowering season anymore,” Mamani lamented. The soil is drier and the potato-growing season has already shrunk from five or six months to four. “We are all joined together by potatoes, in our style of life, gastronomy, culture and spirituality. Potatoes are sacred, we have to know how to treat them, they are important for our livelihoods and they connect us to life,” the ‘papa arariwa’ said. Mamani lives in the village of Pampallaqta. On his farm, which is less than one hectare in size, he grows 280 varieties of potato, most of which grow high up on the mountain. But not only the potatoes are suffering the impact of climate change. Other traditional crops grown by the Quechua, such as beans, barley, quinoa and maize are also being grown at higher and higher altitudes because of the rising temperatures. “We need support in order to adapt our crops,” Mamani said. The curator of the CIP germplasm bank, Rene Gómez, predicts that at this rate of prolonged drought and high temperatures for much of the year, followed by severe frost and plunging temperatures that freeze up the fields, potatoes are “absolutely at risk” in Peru’s highlands. “I estimate that in 40 years there will be nowhere left to plant potatoes [in Peru’s highlands],” Gómez told IPS. He added that although it isn’t possible to halt climate change, alternatives can be developed in order to continue growing this crop, which has been planted in the Andes for thousands of years. But he said that it will no longer be profitable to plant native varieties of potato 3,800 metres above sea level – the altitude of the lower-lying part of the Parque de la Papa. “We are also carrying out an experiment to interpret how the climate is changing, how potatoes are behaving at an altitude of 4,450 metres, and how they survive 200 mm of rainfall a year,” he said. Above that altitude, the highlands are inhospitable rocky ground. Native potato varieties survive temperatures ranging from 2.8 to 40 degrees Celsius. But extreme temperature swings hurt the nutrients of the potato crop. In order to preserve their properties, potatoes need temperatures to remain within the range of four to 12 degrees. An alliance combining scientific innovation with traditional Quechua know-how is taking shape to preserve Andean potato varieties. It includes the Asociación Andes, CIP and the Research Programme on Climate Change, Agriculture and Food Security (CCAFS) of the CGIAR Consortium of International Agricultural Research Centres. While the search is on for crop varieties that can be grown on arid, high-altitude land, native farmers are receiving assistance in the Parque de la Papa to adapt their crops. For their part, local families continue to use traditional techniques for storing and drying their crops. For example, two bitter-tasting varieties of potato – moraya and chuño – that can withstand harsh weather conditions are freeze-dried using traditional techniques employed since the Inca era, and can be stored up to 10 years. Indigenous villagers complain that many local men have to leave home to look for work in the cities, leaving all of the household work, weaving and farmwork to the women. “Our worry now is whether we will have food in the future,” Elisban Tacuri, a villager, told IPS. Ancelma Apaza, a local Quechua woman, told IPS it is more and more difficult to estimate how much food needs to be stored to provide for the family throughout the year. “We women participate in food production and conservation, but now it’s hard for us to know how much food to store, because we don’t know if the harvest is going to be good,” she said. She added that in the Parque de la Papa they are struggling to maintain the culinary traditions inherited from their ancestors, now that they complete their diets with industrially produced food. 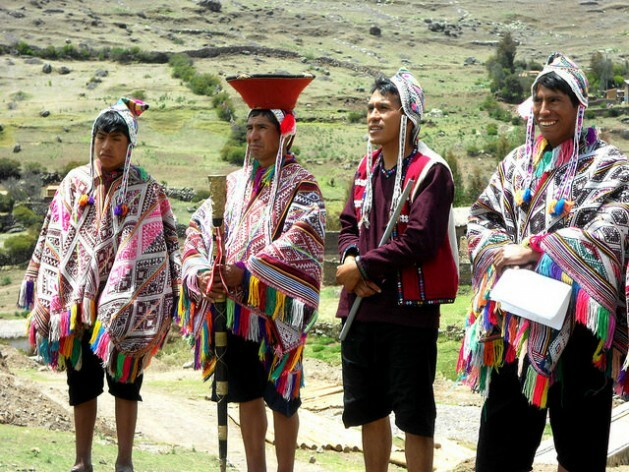 To preserve their sacred crop, the Quechua villagers involved in the park opened a community storeroom in 2011 for potatoes and seeds, which has a capacity of 8,000 kg. It is called “Papa Takena Wasi” – in Quechua “takena” means keep and “wasi” means home. “We keep the potatoes that have cultural value and this storeroom makes it possible for us to share seeds with communities that need them,” said Mariano Apukusi, another “potato guardian”.